One of the most important tools we use while doing a structural inspection is a manometer or water level survey. A water level survey can give precise amounts and areas of floor sag or distress. 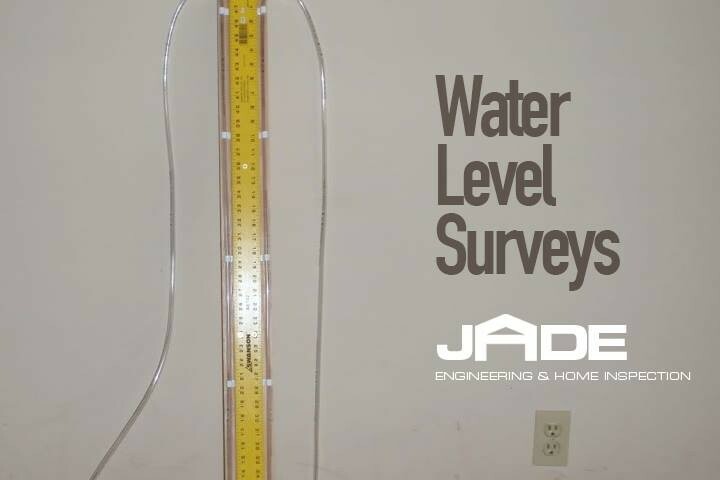 The water level is superior to a standard four-foot level in this type of application because it shows relative elevation readings throughout the entire structure. This includes around corners and relative elevations from the front entry all the way to the rear bedroom. This information can be used to pinpoint areas in the crawlspace or basement that may have problems such as misaligned walls, damage or improper construction such as long-spanning joists. Before the water level survey begins, a floorplan of the structure is needed to record the field data on. This is achieved by going room to room with a standard tape or preferably a laser measure and drawing a rough scaled plan on graph paper. Depending on the complexity of the building, this can be a time consuming process. It is important to find how the rooms line up as well as any offsets, hidden areas and thick walls. An accurate main level floorplan will help in finding the problem areas on other levels of the structure. After the floorplan is drawn, it’s time to setup the water level. A water level starts simply with a jug of water, or in our case a mixture of water and non-toxic antifreeze developed for use in RV’s. The jug is placed on a kitchen counter, fireplace mantel or shelf in a central part of the home or business. The jug is attached to a long medical-grade tube that will reach every corner of the building. At the end of the tube is a 6’ upright ruler. The valves at both the jug end and the ruler end are opened so the liquid inside the tube can flow freely within the device. The ruler can then be taken to various points around the building and the water in the tube, held against the ruler, will show how high the water is off the floor. Water will always stay at the same level, so on a perfectly level surface, the water in the jug will be the same height as the water at the end of the tube. If there is a difference in the measurements, it must be in the floor. So a measurement of 50” in the kitchen and a measurement of 51” in the dining room, means that the dining room floor is one inch lower than the kitchen. We can do this throughout the structure with a 1/8” accuracy. Of course, with occupied homes and buildings, there may be lots of obstructions to contend with. Furniture can be a major obstacle to get around and end up with a complete survey. Pets and kids stepping on the tube can cause improper readings as well. Rooms with different floor coverings require a transition measurement and some of the elevation readings will need to be adjusted. A two-person system works well, with one person holding the ruler and the other untangling the hose and maneuvering it around furniture. After the elevation survey is complete, we can do a quick field review to find problem areas and that will supply a good idea of where to focus when inspecting the crawl space. Eventually, the elevation measurements will be transferred to a scaled CAD drawing that can be superimposed with the other levels of the structure. Finally, a repair plan can be developed and refined by using the superimposed CAD drawings and the water level elevation measurements. Yes, it seems like a long drawn-out and complex procedure. However, it is extremely accurate and reliable. Without using this proven scientific method, any other repair plan or structural inspection is merely conjecture.